ERBIL, Iraq, 26 August 2013 – Rahav picks up my blue UNICEF cap and gently fans me as the discomfort of the scorching heat becomes evident. The gesture is touching considering the long and tiring journey the 15-year-old had to take with her extended family of 26 to seek refuge from her war-torn country. They had just been allocated a tent in the temporary Kawergosk camp near Erbil, in northern Iraq. Dohuk, IRAQ: Syrian refugees wait for buses provided by IOM and the Kurdistan Government to transport them from the Sahela checkpoint to temporary camps in Erbil and Sulaymaniyah. 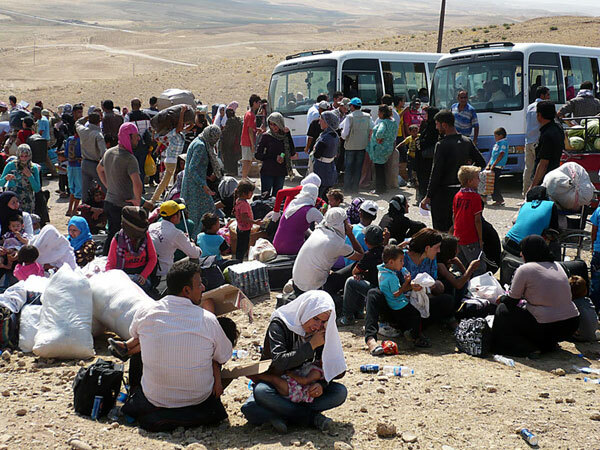 Over 20,000 Syrian refugees flooded into Iraq over a period of few days. The vast majority of this influx is made of children, women and elderly persons. As the influx of Syrians into Iraq fleeing from the ongoing violence in Syria continues, UNICEF and partners rush to meet their urgent needs. Rahav arrived to the Kawaergosk camp last night. She had spent two nights in a tent by the Tigris River where thousands of Syrian nationals were waiting for the Kurdistan Regional Government in northern Iraq to open its border points with Syria. When the border was opened on 15 August, more than 42,000 Syrian national came into Iraq in one week and the influx of Syrian refugees fleeing the violence at home continues. I asked Rahav how she feels now after the difficult times she has been through, her eyes lit up and told me she is glad she and her family found safety and refuge in Iraq’s Kurdistan and now she’s anxious to see if she can back to school soon. On 15 August the Kurdistan Regional Government in northern Iraq re-opened its borders with Syria allowing around 42,000 Syrians to cross into Iraq in one week and the influx continues. The vast majority of those fleeing the continued violence in Syria are children, women and elderly persons. The local government is transporting many of the refugees to temporary camp sites while two new refugee camps in Erbil and Sulayamniyah are being prepared. UNICEF, with its partners, is supporting the local authorities in meeting the urgent needs of these refugees at the border points and the temporary camp sites.